Storm is a specialist combat role for Kig-Yar serving in the Covenant and its remnants, acting as shock troopers. While Kig-Yar Storm were shock troops in the original Covenant, post-war they fill virtually the same role as Kig-Yar Minors. The Kig-Yar Storm combat harness can be found in red, turquoise, and orange. Their Kig-Yar point defense gauntlets are purple. During the Battle of Requiem and the Requiem Campaign Kig-Yar Storm commonly fielded Type-25 plasma pistols and Type-33 needlers, while sometimes using Type-51 carbines. By October, 2558, Storm units had switched to the Type-54D plasma pistol and Type-56D needler as their primary weapons. 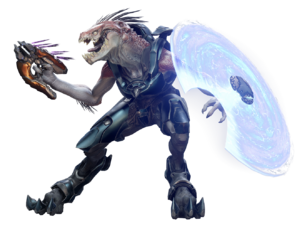 Kig-Yar Storm are relatively easy to defeat by using a precision weapon such as the Type-51 carbine or the M395 DMR to aim between the gaps in their point defense gauntlets. They can also be easily brought down using an overcharged Type-25 plasma pistol shot to the shield, followed by a precision headshot. At close range, they can be killed with one or two melee strikes. Concepts of the Kig-Yar Storm in Halo 4. Alternate view of the Kig-Yar Storm. Render of a Kig-Yar Storm. Another render of a Kig-Yar Storm in Halo 4. A red Kig-Yar Storm from Halo 4. A Kig-Yar Storm and a pair of Unggoy Imperials in Spartan Ops. A Kig-Yar Storm in Spartan Ops. Kig-Yar Storm working with Vata 'Gajat's mercenary group. A Kig-Yar Storm battling Gabriel Thorne on the cover of Halo: Escalation #11. A Kig-Yar Storm aboard the Unrelenting during the Battle of Chi Ceti in Halo: The Fall of Reach - The Animated Series. Kig-Yar Storm getting Spartan charged by Jameson Locke. Profile of a Kig-Yar Storm in Halo 5: Guardians. A Kig-Yar Storm on Escape from ARC. Dead Kig-Yar Storm in Forge. A Kig-Yar Storm in Halo: Recruit.